We have reported the fabrication of Ag nanoparticles embedded in silica substrate for surface enhanced Raman scattering (SERS) by Ag ion implantation and following laser irradiation. The suitable implantation energy and dose are chosen so that the Ag concentration in silica exceeds the solid solubility limit, causes the formation of Ag nanoparticles embedded in silica. 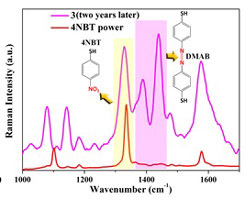 The as-implanted silica substrates are then irradiated by a high-energy pulse laser with different numbers of pulses, and the corresponding Raman measurement shows a remarkable enhancement of Raman activity compared with the unirradiated region. So, the Raman activity of the Ag-implanted substrates could be modulated by laser irradiation. In addition, the laser irradiated region maintained relatively high SERS-activity after exposed to the atmosphere nearly two years.